Elbow, Wrist, and Hand Injury Treatment | Podiatry Associates, P.C. When elbow, wrist, and hand injuries happen, we suddenly realize how much we depend on these parts of our bodies to do even the simplest of activities. If your elbow gets hurt, imagine how painful it would be to reach for the peanut butter on the top shelf. An injured wrist could keep you from being able to open the jar. And if your hand is injured, well you’d better learn to spread jelly with your other hand fast! This condition is the result of repetitive motions, like hitting a backhand shot in tennis, thus its name. It occurs when the tendons on the outside of your forearm become inflamed or start to degenerate. These tendons are what enable you to lift and extend your hands. 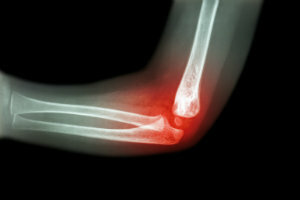 Patients report a burning pain on the outside of their elbow that increases over time and becomes tender to the touch. Caused by swelling of the muscle on the inside of your elbow’s boney prominence, the pain from this condition extends all the way into the forearm. It is the result of activities that use recurring forearm movement, like swinging a golf club, but also like throwing—which is why it is known as little leaguer elbow as well. Also due to repeated overhead motions like swinging a tennis racket or throwing a baseball, this painful condition involves the degeneration or inflammation of the muscles on the front of your arm. These muscles are what speed up or slow down overhead arm movements. Numbness of the fingers and hand are sure signs of carpel tunnel syndrome. This occurs when inflamed tendons in your wrist put pressure on nerves in the hand. It is usually the result of repetitive motions of the wrist, and can make holding small objects difficult. If a wrist is forcefully bent backwards, the ligaments can tear resulting in a sprain. Symptoms include swelling, discoloration, tenderness, and pain with motion. If a person falls and lands on the palm of their outstretched arm, it often results in what’s called a scaphoid fracture. Pain is typically on the thumb side of the wrist and increases with subsequent motions. The most common type of wrist fracture is called a Colles fracture, which can also happen by falling on an outstretched hand. Pain and tenderness are present when flexing your wrist. Like your wrist, when a thumb is forcefully bent backwards it can stretch and tear the ligament, resulting in a sprain. This is often referred to as gamekeeper’s thumb since it is caused by such activities as catching a football, baseball, or basketball. The injured joint will be swollen, tender and painful with thumb movement. Finger injuries can include bone, ligament, or tendon damage. If not treated, these types of injuries can lead to deformity and loss of function permanently. Dr. Jennifer Molner can provide the care needed for a full recovery. For most elbow, wrist, and hand injuries, treatment is similar. Patients should refrain from participating in physical activities. Splints or casts may be used to immobilize the injured area. In severe cases, surgery may be considered. Rehabilitation at Castle Pines Physical therapy will include strengthening and stretching exercises, with a focus on proper techniques to prevent injuries from recurring. Elbow, wrist, and hand injuries can not only sideline you in your sport, but can get in the way of day-to-day activities as well. To get back into the swing of things, visit Castle Pines Physical Therapy in Castle Pines, CO. Make an appointment with Dr. Jennifer Molner by calling (303) 805-5156, or check us out online.